D'Angelo Grilled Sandwiches franchise business opportunity. Free D'Angelo Grilled Sandwiches business franchise information. 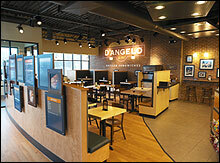 D'Angelo Franchising Corporation recently announced plans to add 120 new shops in the next five years. D’Angelo Grilled Sandwiches, with more than 200 locations, is seeking qualified individuals and companies interested in multi-unit growth. Immediate opportunities in NY, NJ, CT, and Orlando, FL, requiring development of at least 3 units. Single unit franchises are available in select markets within New England. Franchise opportunites may be considered in other U.S. markets to qualified investors who develop a minimum of 20 units. Founded 37 years ago on a philosophy that was simple and honest: put the best quality ingredients, in the freshest breads, for a reasonable price and serve it quickly! Guests are passionate about our food and trust our quality. Our key difference is our grill. No other leading sandwich chain has a grill. D’Angelo has a proven system and proudly serves over one million guests monthly. Over half of our franchise shops exceeded $600,000 in sales the past fiscal year. Detailed "Earnings Claim" -- Item 19 in our UFOC. More than 150 company-operated locations keeping us on the cutting edge of QSR trends. Brand loyalty: nearly 60% of our guests visit at least 3 times per month. D'Angelo has a proud tradition of supporting our franchisees and team members in the same manner we serve our guests, with the utmost attention and respect. With your commitment and hard work, we can help you build a very successful and rewarding D'Angelo Grilled Sandwiches franchise. The following information provides a quick overview to help you get started. We provide extensive operational support to our franchisees. Our regular visits go well beyond walk-through inspections. We roll up our sleeves and assist you in evaluating all areas of your business. We help you maximize your assets through sales growth and cost control. Our tremendous brand recognition will provide greater leverage when acquiring financing from third-party sources. D'Angelo Franchising Corporation has several pre-approved lenders that we can refer to you. Our Construction Department will provide you with plans and equipment specifications for a standard D'Angelo Grilled Sandwiches. Your architect will adapt our standard plans to fit the approved site and specific building characteristics. We will recommend suppliers for equipment, who can meet your build-out schedules. We offer you one-stop shopping for everything you will need. In a classroom and in the field, you’ll learn everything you need to know to run your business. D'Angelo Grilled Sandwiches have a tradition of effective, innovative advertising and marketing programs that have helped establish D'Angelo as one of New England's most popular brands. A Franchise Candidate must satisfactorily demonstrate the financial capability to open and operate a D'Angelo Grilled Sandwiches Franchise. To learn more about the D'Angelo Grilled Sandwiches food franchise opportunity, simply complete the form below.